The skin of your lips is extremely sensitive and it becomes necessary to protect them from external impurities which leads to lip darkening, uneven lip color, chapped and pigmented lips. Lip care products help protect and preserve the healthy condition of your skin by restoring the proper moisture level. 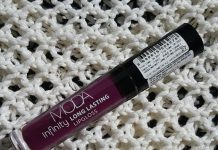 Often we look for lip care products which cares for them all day long and keeps it unaffected by external influences such as cold, wind, rain and ultraviolet rays. In order to protect your lips from these harsh influences, usage of a proper lip balm is a mandate, today I’m listing top 14 lip care products by Nivea which definitely is one of the most reliable lip care brand that act as a shield to your delicate lips. Nivea Essential Lip Care is a kiss of moisture on your lips that provides long lasting moisturisation. 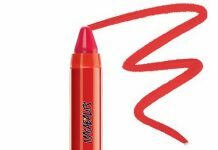 Its rich, caring formula protects the lips from dryness. It is enriched with natural Jojoba Oil and Shea Butter that leaves lips feeling soft and smooth. Treat yourself to a velvety soft lip feeling with Nivea Soft Rose Lip Balm. Scent of roses and caring jojoba oil combines to create an innovative formula that delivers subtle rose sheen and long lasting moisturisation to leave your lips soft and smooth. Enhance your lips with light pink shimmer and a soft glossy colour, as you use Nivea Fruity Shine Pink Guava Lip Balm that provide your lips with long lasting moisturisation along with delicious Guava scent. The innovative formula of Nivea Fruity Shine with pink guava extract, sweet almond oil, jojoba oil, shea butter and shimmering pigments provides moisturisation and protect your lips from harmful UVA & UVB rays with SPF10. Enriched with almond oil and delicious strawberry flavor, Nivea Fruity Shine Strawberry helps keep Lips moisturized & look beautiful. Kiss of strawberry in this lip balm delivers fabulous reddish shimmer to your lips. Its SPF 10 formula helps protect lips from harmful UVA/UVB rays. With Nivea Vitamin Shake Cranberry and Raspberry, seal in the moisture of your lips by the Hydrating formula, swirled together with fruit extracts and enhanced with vitamins C, E and pro B5 for intensive long lasting moisture. It also contains SPF 10 Formula that helps protect lips from harmful UVA/UVB rays along with soothing fruity fragrance & subtle flavour. Add glamour and gloss to your lips with the high-gloss formula of Nivea Glamorous Gloss Pink Sugar Lip gloss. Ultra-shine pigments and an exotic fruity scent give your lips a brilliant blush of pink glow, while shea butter and vitamin E combines to provide long lasting moisturisation without sticky feeling. It also contains SPF 15 to protect the lips against UVA and UVB rays. Nivea Hydro Care lip balm is enriched with pure water and aloe vera for long lasting intensive moisturisation. This hydrating colorless lip balm is perfect for those who wants to protect their lips and look beautiful naturally. The light non-greasy formula of Hydro Care lip balm quickly absorbs and leaves a fabulous soft feeling on your lips all day long. Nivea Lip Medical Protection with SPF 15 provides extra care and long lasting moisture that strengthens the resistance of your lips against external influences. Enriched with natural ingredients like bisabolol and wheat germ oil, it effectively support lips natural moisturisation process and protect them before they crack, leaving it healthy, soft and smooth. Repair chapped lips & beautify it with healhty color with Nivea Repair and Beauty’s innovative dual core technology. Dexpanthenol gives instant relief and effective repair for dry and chapped lips while giving them a beautiful touch of rosy finish. It provide lips with long-lasting moisture improving lip skin moisture over time. Treat your lips with Nivea Pure & Natural Olive and Lemon lip balm which provides an intense care to your lips through its long lasting moisture and protection formula. Lemon Extract, Olive Oil and Vitamin E combines their moisturizing effects to soothe and nourish dry rough lips. Nivea Pure & Natural Camomile and Calendula is an extra mild lipcare. Look & feel naturally beautiful with soft and healthy lips. Calming chamomile, soothing calendula extracts, certified organic shea butter, jojoba oil come together to heal & protect sensitive lips with extra mild care. Experience an irresistible shine, nourishing softness and SPF 10 sun protection all at once with this Pearly Shine lip balm. Pearl and Silk Extracts combines with the goodness of sweet almond oil, grape-seed oil and Shea butter to keep your lips smooth & soft with delicate pearly shimmer. 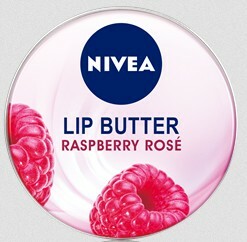 Beautify your delicate lips with Nivea Lip Butter Raspberry Rose, Its’ an aromatic treat for the lips. It comes in an innovatively designed round tin packaging that unites long-lasting moisture, exotic flavors and a unique lip care experience. The rich formula of Shea butter and almond oil provides intense long-lasting moisture restoring suppleness and recreating beautifully soft lips with added silky gloss on your lips. 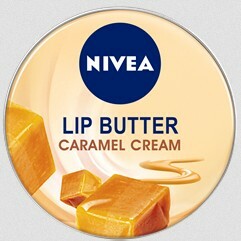 Pamper and nourish your lips with yet another exotic flavor of Nivea Lip Butter, Caramel Cream is an aromatic treat for the lips which repair chapped lips and comes with a rich formula that makes the lip butter melt on the lips creating sensationally soft lips with a hint of soft shine on your lips. 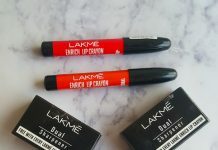 Hey on which online shopping website are these lip balms available in India. These looks so stellar and I wish to buy all of them but those butter lip balms are not available at any online shopping website. Please reply ASAP when u see this coz I wanna buy them right now.